I am Pete Spencer, Deputy Commissioner for Budget, Finance, Quality, and Management at the Social Security Administration (SSA). Thank you for inviting me here today to discuss SSA’s real property portfolio management. We fully support the work that the Chairman and subcommittee are doing with the General Services Administration (GSA) in looking into opportunities for the Federal Government to benefit the taxpayer through negotiating new rates in long-term lease situations. To give you an idea of the scope of our real property portfolio, we are GSA’s fourth largest customer in terms of the number of commercial leases and their fifth largest customer in rent costs and square footage. Currently, we have 1,855 occupancy agreements1; nearly 85 percent is in leased space. SSA leases approximately 26 million usable square feet of space from GSA to conduct its business operations. More than half – 991 – of our occupancy agreements are set to expire between now and the end of fiscal year (FY) 2019. We will be working closely with GSA on reducing our costs on these leases and appreciate this subcommittee’s support. With regard to the Administration’s Freeze the Footprint initiative, we are making significant progress. In fact, by the end of FY 2015, we are on course to reduce our footprint by nearly 2 million square feet below our 2012 baseline. As we move forward on this initiative, we remain fully committed to our network of local field offices. We appreciate the importance of our community presence to many of our most vulnerable customers, and acknowledge that our efforts to improve efficiency should not come at the expense of customer service and the availability of staff to interact face-to-face with the public. Before I explain our Freeze the Footprint accomplishments, I would like to give you an idea of what we do at SSA. SSA provides benefits to Americans when they retire or are disabled, as well as auxiliary and survivor benefits to dependents of workers, and means-tested cash benefits to disabled, blind, or elderly individuals with limited income and resources. We also provide beneficiary services for the Medicare program, accepting and processing applications for Medicare enrollment, and respond to beneficiary and public inquiries regarding general coverage and billing issues. Led by Acting Commissioner Carolyn W. Colvin, the Agency has a nationwide staff of about 65,000 employees. Our central office is located in Baltimore, Maryland, and the field organization is in communities across the country to serve the American people. The field organization includes local offices, which are often one of the public’s main points of contact with the Federal Government, as well as hearing offices, teleservice centers, program service centers, and regional offices. The local offices and hearing offices provide in-person, face-to-face service to the public, and, therefore, need sufficient space to support this public interaction. We require visitor-waiting areas, secure interviewing areas to ensure the safety of the public and our employees, hearing rooms, and counsel rooms to ensure privacy and confidentiality, as well as separate restrooms for employees and the public. In 1936, when we opened our first local field office in Austin, Texas, every transaction was completed in person, on paper, and required the applicant's signature. Having a physical presence in a variety of locations was essential to delivering quality service. Over the past 78 years, we have expanded from that single field office to more than 1,200 field offices. Field offices vary in size from having just a few employees to up to 75 employees, but most require between 20 and 40 employees. Our field offices provide in-person service for all agency-related matters, offering a full range of Social Security services, including applying for new or replacement Social Security cards; applying for Retirement, Disability, Survivor, Medicare, and Supplemental Security Income benefits; and changing beneficiary information (i.e. change of address or direct deposit information, income, reporting work activity, etc.). In addition to these local field offices, as of FY 2014, our Office of Operations facilities includes 29 teleservice centers, 8 processing centers, 14 Social Security Card Centers (SSCC), and other support offices. Teleservice Centers answer general inquiry calls from the public to the Agency’s National 800 number. In FY 2013, our 800 number handled over 53 million transactions. Processing Centers process more complex claims-related actions that cannot be processed to completion in the field office or automatically via our computer system. In the past decade, we have established SSCCs in metropolitan areas that experienced growing enumeration workloads. This provides enhanced customer service, as SSCC employees have more expertise in this sometimes complicated area. Redirecting the high volume of people in need of assistance with Social Security Number-related services to the SSCC allows field office staff in those areas to focus on providing our customers other claims-related services. Today, delivering many of our services no longer hinges on in-person contact. Our telephone, online, and video services provide the public with on-demand access to our programs at their convenience. We continue to evaluate the best means of meeting our commitment to deliver Social Security services that meet the changing needs of the public. Although online services have enhanced our service delivery options, because of geographic, generational, and cultural population shifts, our physical presence is still very necessary across the country. In FY 2013, over 43 million people visited our field offices and card centers to transact business, many accompanied by others (family, representatives, translators) not included in this count. The Agency’s Office of Disability Adjudication and Review (ODAR), which may be the largest administrative judicial system in the world, issues more than 700,000 hearing dispositions and over 160,000 appeal dispositions each year. Currently, ODAR facilities consist of 162 hearing offices, five national hearing centers (NHC), two national case assistance centers (NCAC), 10 regional offices, 158 permanent remote sites, and various other support offices. Like our field offices, our 162 hearing offices are located in communities throughout the country. Administrative law judges (ALJ) conduct hearings and issue decisions on initial claim appeals. ALJs may also travel to other sites, such as local field offices or permanent remote sites, to conduct hearings. NHCs conduct video hearings in all 50 states, the District of Columbia, and Puerto Rico. These units also assist the local hearing offices by processing backlogged cases due to increased requests for hearings and local staffing shortages. Since ODAR has an all-electronic case file, the NCAC, located in St. Louis, Missouri, can pull and write cases nationally, regardless of the case’s state of origin. Most of our remaining workforce is at headquarters, and is housed in federally owned space on the main campus in Woodlawn, Maryland or in leased space in Falls Church, Virginia. We also have regional offices located in 10 cities across the country to oversee and support operations in multi-state areas. We have made significant progress in restricting the growth in our office and warehouse real property inventory under the Administration’s March 2013 Freeze the Footprint guidelines. Our most recent report—published on performance.gov—shows in comparison to our FY 2012 baseline, we have decreased our usable square feet from 26,367,253 to 26,031,626, a reduction of 1.27 percent. During this same period, we also slightly reduced annual rent costs, from $754,698,276 (FY 2012 baseline) to $753,082,828 (FY 2013 actuals), a reduction of about 0.21 percent. Although our continued presence is necessary in numerous locations across the country, we are making concerted efforts to restrain our overall real property inventory. We evaluate potential consolidations and pursue them where it makes good business sense, as long as they do not adversely affect customer service. Additionally, we work hard to avoid lease overlaps when moving an office from one location to another. The following describes current plans to maintain our FY 2012 footprint through FY 2015. As part of our Headquarters Master Plan effort, we are reducing the number of leased facilities in the Woodlawn, Maryland area and relocating staff to federally owned central campus buildings. This year, we vacated and terminated leases at one facility,2 disposing of about 242,000 usable square feet of leased office and warehouse space and saving $4,175,000 in annual rent costs. We will continue to consolidate staff from many leased locations3 into existing, federally owned headquarters office space. In 2014, we vacated the Metro West facility in downtown Baltimore, Maryland. GSA recommended disposal of the facility well before the Freeze the Footprint policy was announced because the facility needed repairs that far exceeded the building value and was much larger than justified by current and anticipated staffing levels. We vacated the Metro West facility and relocated to a newly leased facility. GSA has begun its building disposal. The annual rent for Metro West was $10,627,968, and the total usable square footage was about 830,000. We relocated all remaining Metro West employees to a newly constructed, leased facility on Wabash Avenue within Baltimore city limits. GSA received congressional approval for this project in May 2006 and awarded the lease in October 2010. The new building has approximately 470,000 usable square feet of office space. In addition to the Metro West employees, the new facility also houses employees from other leased facilities in the Woodlawn area. When staff moved to the new Wabash Avenue facility from these other leased facilities, we were able to return approximately 162,000 usable square feet, saving an additional $3,849,000 annually. Federal funding from the American Reinvestment and Recovery Act of 2009 has funded construction for the National Support Center (NSC) in Urbana, Maryland. The NSC will serve primarily as a data center and, therefore, will not be included in future reporting related to the Freeze the Footprint policy. The new Federal building will replace the data center function that currently is housed at the National Computer Center (NCC) on the headquarters campus. The aging NCC facility was designed around a 1970’s mainframe environment, and is simply no longer appropriate for modern data center housing. This facility, however, does provide useful office space and will remain in the Agency’s portfolio. We are developing plans to backfill space in the NCC, further supporting reduction of leased space in the Woodlawn area. We very much appreciate the subcommittee’s support of our new data center. We rarely have vacant or excess space in our inventory. We minimize our rent liability by ensuring new office space is ready for occupancy at the time we terminate the current lease. During the relocation planning process for field offices, we determine our space needs based on the most recent service delivery assessment and apply the Agency’s space allocation standard using current staffing levels. As of September 30, 2012, the Agency had offices in over 1,600 buildings comprising approximately 26.4 million usable square feet of space, of which 18.8 million usable square feet was leased, and 7.6 million usable square feet was in Federal space. 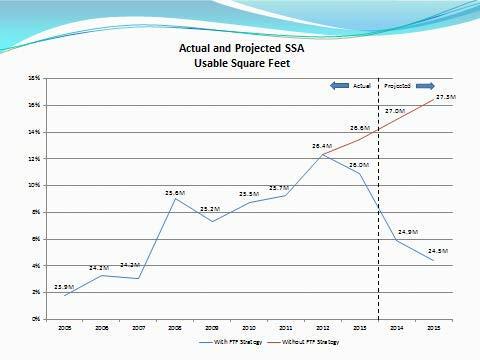 The chart below shows our FY 2012 baseline figures, FY 2013 actual figures, projected usable square feet, and annual rent costs for FYs 2014 and 2015. The data represent decreases in total space usage over time. This reverses the trend of the past decade, which saw an increase in our portfolio of nearly 20 percent. Two major factors contribute to controlling real property growth. In December 2011, we centralized the space acquisition process to require headquarters approval of all requests. Several months later, we implemented revised space allocation standards, which limit the amount of space we request from GSA. These new policies ensure consistency in space requirements submitted to GSA across regions and from one field office to another. Although we anticipate a reduction in space over the next several years, our rent costs will increase. Increases in rent are the result of previously negotiated rates on field leasing projects expected to enter our portfolio in the coming years. In many cases, the new rate is higher due to the age of the expiring lease and because tenant improvement costs are included. Our standard for newly occupied field office space requires the construction of a barrier wall to separate public areas from employee areas. Even if we renew a lease for existing space, tenant improvements may be needed to add a barrier wall, because this standard was not in effect until a few years ago and was mandated last year. Tenant improvements are also required for ODAR offices to build public waiting areas, counsel rooms, and hearing rooms in new locations. Our revised office space allocation standard recognizes that as technology changes the way we work, we are able to do the same job in less space. Thus, the new space allocation standard takes into account changes in technology and workflows and provides reduced space requirements for personnel and support areas. For example, since we began using electronic storage, the standard provides less storage space for paper files. We anticipate that continued virtualization of data will further reduce storage needs, for both paper files and data equipment. The revised field office space allocation standard will require more efficient space planning for employee workspaces and support space. On the other hand, the revised standard reflects improvements in service to the public. Specifically, increased space is available for reception areas to address the needs of the public and security requirements. Overall, we estimate that as we complete space acquisition actions using the revised standards, which may take years because of existing commitments, we will reduce field office sizes by a projected average of about three percent. In addition to the field office space allocation standard, we also issued revised space allocation standards for our large facilities. This space allocation standard applies to all of our headquarters components, including the main complex in Woodlawn, Maryland; ODAR’s operation in Falls Church, Virginia; our ten regional offices; processing centers; and Mega-Teleservice Centers. The revised space allocation standard has reduced office sizes and redefined support spaces to optimize utilization. We are also working to update our space allocation standards for our ODAR offices nationwide. In many cases, we are able to avoid new space acquisition through alternative approaches, such as consolidation with existing offices and increased use of technology. Consolidating Permanent Remote Sites with Field Offices: We have eliminated the use of temporary hearing sites and we are replacing them with claimant-only video and permanent remote sites (PRS). A PRS comprises a video hearing room that may be a stand-alone facility or consolidated with a field office or other existing Agency facility. This will require a slight increase in space needed in our field offices, but will allow us to operate more efficiently and provide individuals with a more convenient, secure, and dignified hearing environment. Video hearing technology will help reduce hearings backlogs and average processing time for decisions on hearings cases. Any increase in these types of locations will be monitored and offset by consolidations, closings, and reductions in space. Consolidating Two or More SSA Components: We make an effort to house two or more components in the same space wherever possible. While some components have restrictions for space sharing due to the sensitivity of the information they handle, we attempt to consolidate various types of offices when feasible. For instance, a regional office may be located in the same space as an area director’s office or a program service center, or an ODAR hearing office may be located adjacent to a field office. This allows us to maximize the use of our resources such as sharing conference rooms, information technology support space, restrooms and reception areas, as well as share security guards and equipment, thus reducing operating costs4 while also providing a greater convenience for our customers. Online Services: We have created a new foundation for increasing our online services with the my Social Security portal, which we established in 2012. Online services allow customers to conduct business with us from the comfort of their home. Our vision is for my Social Security to be the portal through which customers who so choose can conduct all their business with us. In the two years since we launched my Social Security, over 12.3 million individuals have registered, with 4.9 million (40 percent) of the registrants being people aged 62 or older. We will continue to expand my Social Security to include additional services in the future. Telework: We recently expanded the number of employees eligible to work remotely. As we gain experience – based on workloads, union agreements, and other administrative concerns – we may expand even further. While we understand there are potentially significant real estate and transportation cost savings to be gained from telework, we must ensure that it allows us to continue providing efficient and effective service to the public, while protecting personally identifiable information. Virtual Claims Taking: Using video technology, field offices are able to take claims remotely. A client located in one field office can work directly with a claims taker from another field office via computer. This allows us to meet customer service expectations in high-traffic offices without adding staff and space to those offices. Video Conferencing: Changes in technology and Agency policy allows face-to-face conferences to take place over a virtual network from various locations, which also helps us reduce the total amount of conference space necessary. Throughout our history, Social Security services have been dynamic, shifting to meet the changing needs and expectations of the American people. Standing still is not an option. We have continuously adjusted the way we do business to manage our growing workloads and meet the changing expectations of the public in a responsive and compassionate manner. We remain fully committed to providing the service the public expects, whether it is in one of our many field offices, on our National 800 Number, or online at SocialSecurity.gov. We understand that high quality service comes at a cost to the taxpayer and we are working with GSA to reduce those costs in connection with the many buildings we occupy. We thank the subcommittee for its support. 1 Some buildings that we occupy have multiple occupancy agreements. 3 Including Windsor Corporate Park, the Dunleavy Building, the Woodlawn Office Complex, and the Reisterstown Plaza field office. 4 Due to the sensitivity of the information we handle day to day, we do not currently co-locate with other agencies. We do share buildings with other agencies, such as GSA-owned or leased facilities; however, although we may share common-area restrooms with other agencies, we maintain distinct space separations and occupancy agreements.